Wandering along a Budapest restaurant alley recently with Mrs Ricshaw, we kept being asked whether we would like to dine in each establishment we passed. Of course, our answer was a polite No thank you. This became difficult after a while and Mrs Ricshaw detected a growly sod-off moment coming. This will allow purveyors of goods and services to save their energies and concentrate on those without hats. It will also allow the wearers safe passage through restaurant alleys, souqs, or that place near the Great Wall of China with hundreds of desperate thimble sellers. We would need a call for hats and some sort of international conference to agree it. This is because the yet is important and would drive the need for international consensus. We cant have stetsons, bowlers, berets, keffiyehs, hachimaki, fezes, baseball caps, turbans and so on. Maybe they can also sell hats. A tinfoil balaclava held together with sticky tape generally deters even the most foolhardy importuner. 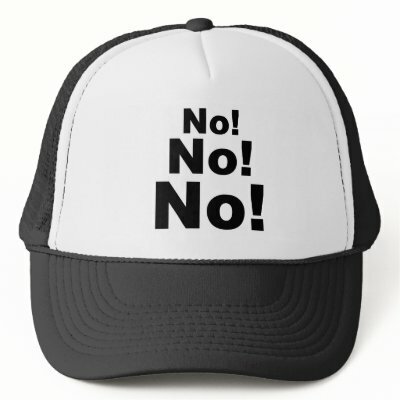 "Would you like to buy a new 'No Thank You' hat? - look this one's far nicer than your current 'No Thank You' hat - just today, just for you sir, these are 50% off. Come on, you look like a nice man - I'll even throw in - for free! - this 'No Thank You' cravat. Only $10 this hat, premium quality - it's the lowest I can possibly let you have it for. I've got a wife and children to feed sir, look here are their photos..."
Should be a hood with a full face cover! I had red leds implanted in eyes for this very reason, a quick flash and everyone thinks I'm Rick moranis from ghostbusters and everyone knows he's broke. How about a cap badge that reads "Hi, I'm Greek" ? I think that your mistake, Mr Ricshaw, was in saying no. Any reasonably sharp-witted tourist would have said "Yes," to every offer, "but that man down there offered me 10% off!" and then stood back whilst the restauranteurs beat each other to a pulp in order to decide which one got the honour of having you grace their establishment. If it was a slow night, the competitive discounting might have been so fierce that one of them might have ended up having to pay you for eating their food. I walk through crowded marketplaces like this with large mirrors attached at port and starboard, like a sort of sideways sandwich-board. Eager restaurant-owners and pedlars find themselves shouting at, and then haggling with, reflections of themselves, beating down their own prices and imploring themselves to sample their wares.